Gujia is a popular sweet dish of north India. Gujia recipe is associated with the festival of Holi. The festival of Holi is known for its colors as well as scrumptious recipes. Several recipes like Dahi Bhalle, Bhaang Pakode, Thandai, Papadi and Gujia are the special dishes for the festival. 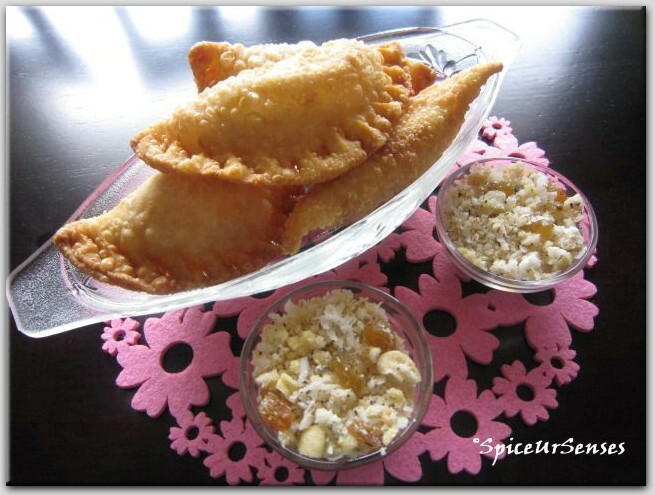 Gujiya is a scrumptious sweet dish prepared using maida and khoya. It is a must to make Holi dish in most of the Indian homes. Though the preparation of Gujiya requires a little time and efforts, the taste of this delicious recipe is worth it. 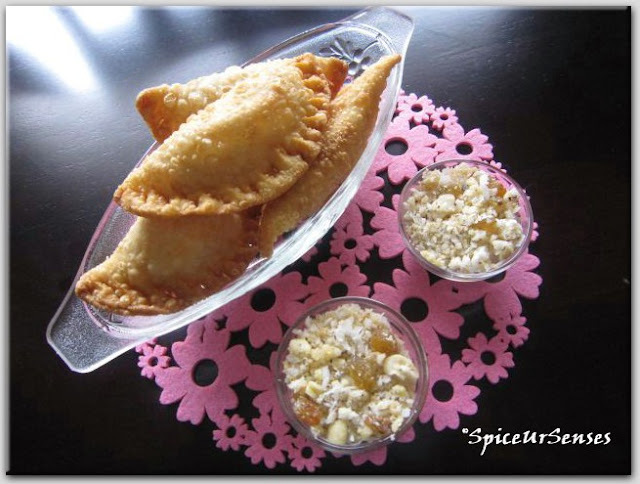 The best thing about Gujiya is that it can be used as a sweet dish, dessert as well as snacks. It can also be preserved for along time without any effort. If you are also interested in making Gujiya this Holi, the recipe is given below. Combine maida with 6 tbsp of oil using your fingers. Make soft dough and knead it lightly. Add water if needed. Cover with a wet cloth and leave aside. In a frying pan, deep-fry the khoya till light brown in color. Add chopped almonds, sugar and raisins and mix well. Fry again for few minutes. Allow the mixture to cool. Prepare a small and thick chapati from the kneaded dough. Stuff half of the chapati with the khoya mixture. Fold and draw the edges of chapati inwards to close. On slow fire, deep-fry the gujia till golden brown. Take out using a sieve and drain the oil properly. Store them in an airtight container. Prefectly prepared gujia, looks elegant.. Perfect and looks so yummy! 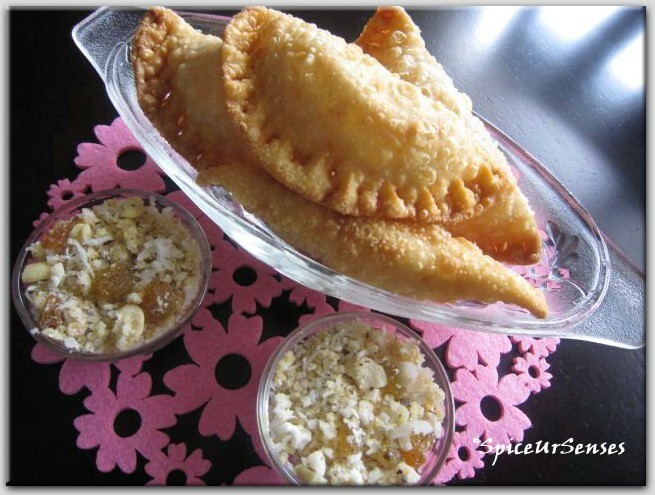 Lovely gujias Rumana..Looks simple and yumm.. Welcome back, Rumana..How have you been? Perfect and delicious gujiya..I had the opportunity to taste this awesome sweet during my stay in IIT Kanpur for my masters project..My labmates used to bring this sweet for us and I loved it a lot..Thanks for sharing the recipe, Rumana..I will surely try it sometime..Did you use a mould for making this or did you use a fork to make those impressions? I think I've seen those before, but I dont think I've ever had one. Sounds delicious though! gujiyas looks lovely... first time to your fabulous site... happy to follow u.. visit my site whenever u have time..